In understanding how a project like the one I posted about previously might unfold, it is important to look around to other projects for inspiration. While I believe that what Bruce Newlands proposes represents a significant step in establishing open source ideas within the context of architectural practice, there exist a number of projects that have already demonstrated similar application in a number of interesting ways. As I mentioned previously, there is a cohesive strategy to Bruce’s vision that runs from project outset (community gathering, data collection) through to final outputs (open mapping knowledge, architectural responses), that all draw from an open source ethos. It is this strong interconnection between project inputs and outputs that is perhaps the most unique contribution that this project makes to a so-called open source architectural practice (or at least my own imagining of such a practice). A number of recent architectural projects have used crowd-sourcing techniques in the gathering of data and as a form of community engagement. Equally, a number of architects have offered their designs through innovative copyright licenses (Creative Commons), derived from the licenses that software developers created to ensure the free distribution of their own open source creations. The Stalled Spaces project would revolve around a community that would apply open source methods and ideas to all stages of its unfolding. The gathering and use of open source data would feed into the generation of creative proposals, and these proposals in turn would be shared in as open and accessible a manner as possible. At each step of the process, there is a focus on how sharing ideas and data might provide new opportunities to local communities and those further afield. Below are a number of projects that have informed my own research, and that I believe are key precedent for this ongoing project. They are grouped by whether open source/crowd sourcing methods have been used in either the ‘input’ or ‘output’ stages of their development. Neighborland is one of a number of web-based ‘open urbanism’ platforms. These websites act as social networks where users can post about problems they have encountered in their local area, or places that they think can be improved through a specific intervention. This can be anything from improving on poorly marked cycle paths through to the establishment of local markets to the opening up of previously closed public data to new uses. For the most part, these networks act much like traditional pressure groups; giving political agency to disenfranchised or dissatisfied citizens. However, the ease with which individuals can engage with the process, through online websites and social networking, helps lower the barriers to entry, and individuals with shared concerns who may have had no means to coordinate are more easily connected. A catalogue of issues is created, and those that prove most popular amongst users may then be taken further, through either more traditional political channels, or approached from a more guerilla strategy; users of the platform seeking to remedy problems or create new opportunities while bypassing local authorities entirely. These platforms are rarely focussed on the specifics of how to solve urban problems. Instead, their positives lie in providing a straightforward and intuitive way for individuals to voice their concerns, as well as their aspirations for their local neighbourhoods. Local governments and other organisations are able to gain access to up-to-the-minute opinions and ideas, the ‘crowd’ helping to shape and intervene in local development. 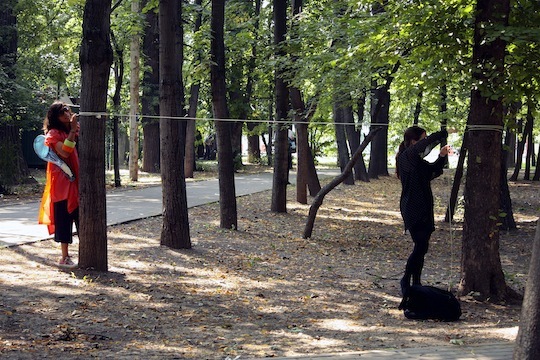 The cooperative urbanism project, undertaken by artist collective Partizaning, in Moscow in 2012 is representative of a more hands-on and playful form of citizen engagement in the mapping of local issues. Through a series of workshops and events involving the Partizaning group, the Strelka Institute (a Moscow postgraduate institute devoted to exploring new perspectives to tackling problems within Russia) and local people, an ethnographic map of problems and possible interventions was developed. Amongst the projects undertaken was mapping with the use of images taken from flying kites, the pinpointing of local food outlets, and creating ideas for new games that took advantage of local surrounding. While many of these projects are more ephemeral and high-spirited than those developed on platforms like Neighborland, the excitement of this project is drawn from its deep, ethnographic engagement with local people, gathered together physically in one-off events. While digital tools are employed, and a thorough record is produced for future use, this project, and others of its ilk, are centred around the fostering of a community of those who want to take part in the generation of their local place. Yasutaka Yashimura’s 2010 project, the Creative Commons House was an early experiment by an architect in taking advantage of the Creative Commons licensing system. These licences are derived from those created by open source software developers, who sought a method of copyright protection that encouraged sharing and re-use by others, while ensuring that commercial organisations could not brazenly take advantage of their work. As Yashimura himself acknowledges, copyright in the field of architectural design is a relatively grey area. The application of the Creative Commons licence in this instance seems more an attempt to highlight the architect’s desire for others to use his work and redevelop the project’s basic parameters to their own ends. The design itself is a relatively unremarkable, if rather elegant, modular frame housing system that can be configured in a number of ways. There is little evidence that I can find online that this aspiration has been seized upon by others, but it remains a laudable ambition in a field where, far too often, relentless and often needless innovation is prioritised at the expense of basic-principles. The Worldchanging platform is the coordinating hub of the charity Architecture for Humanity. The platform is design both as a social network where many of the activities of architectural practice can take place (storage of drawing files, calendars, discussion boards etc.) as well as a repository of numerous creative projects that are all shared using a number of Creative Commons licenses. The charity’s aim with the development of this platform was to allow architects to upload their own solutions to humanitarian design problems, and the use of the Creative Commons licensing is in line with the wish for those on the ground in areas affected by these stations, to be able to access all necessary data in order to adapt and construct them to their own needs. Open and freely accessible ideas and data is central to an organisation keen to provide practical assistance to those in areas devastated by natural and man-made disasters. The platform itself could in theory be used to host any number of projects for any purpose, it is only the direction of the charity itself that focuses much of the activity towards a humanitarian end. The concept of application of open source ideas within the field of architecture as being towards ends with a perceived ‘public good‘ seems intuitively to be a likely focus of future development, an idea that I am focussing some of my research on. If the Creative Commons House project is an embryonic and prototypical experiment in sharing architectural design as open source software is shared, and the Worldchanging platform an admirable extension of the idea with a humanitarian agenda, then Wikihouse is an impressive attempt to expand the idea towards the practical realisation of physical architectural form. Just as with the Worldchanging platform, the Wikihouse website exists as a catalogue of projects, each of which can be accessed, adapted, and used by anyone. However, the focus for the Wikihouse team and contributors to the site is the creation of projects that are highly detailed, to the point that someone can quite simply download them, run the files through a digital fabrication tool, and voilà, you have a usable structure. To date, most of these projects have been designed to be fabricated from plywood using a CNC-router, but as advances in digital fabrication technology advances, there seems little limit to where such a repository of designs may go. Alongside a number of fleshed-out structures that can be downloaded from the site, there are architectural details such as joints which can be adapted for use in other projects. The fact that the Stalled Spaces project is based in and around Maklab means that there is significant possibilities for taking advantage of this technology, as well as developing new ideas to contribute to the Wikihouse website. The above only represents a small sample of projects that can be described as exploring ideas and concepts derived from open source software development, particularly crowd sourcing and novel copyright forms. They are however, presented as a cross section of some of the key ways that I believe the Stalled Space project might unfold. Bruce’s idea of this as a projects very much rooted in a local context, and engaging local people in their built environment, perhaps means that the project may share more in common with the ethnographic methods of the Partizaning project than the large-scale coordination of platforms like Neighborland. At the same time, the desire to seek physically realisable ideas, tied to the incredible fabrication resources of Maklab, suggests that Wikihouse represents a possible ‘plugin’ technology in the output stage of the project, just as Open Street Maps provides a ‘plugin’ in the data-collecting input stage. All these projects however, are predecessors in some respect to the vision of Bruce’s idea. There are a few other projects that I will cover in more detail in future posts that represent precedent to more specific aspects of the projects process, such as the use of ‘mapping parties’ and collaborative design and construction. Keep tuned!